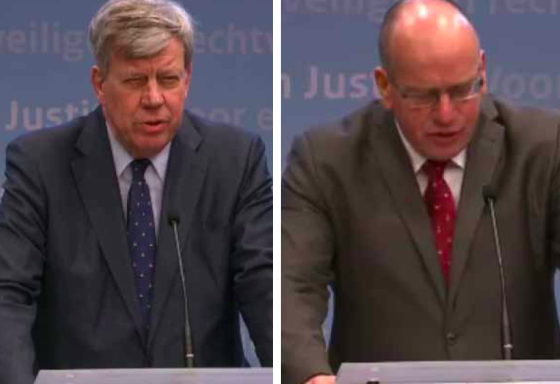 Hardline justice minister Ivo Opstelten and his deputy Fred Teeven have resigned following revelations about a 4.7 million guilder payment to a convicted drugs baron in 2001. Speaking at a news conference on Monday evening, Opstelten said further investigation by his officials had led to the discovery of ‘digital confirmation’ that showed Cees H had been paid 4.7 million guilders, not two million guilders as he had consistently told parliament. Teeven said his credibility had been damaged by the situation and that he could no longer carry on in the job without Opstelten. Nevertheless ‘there was nothing wrong with the deal,’ Teeven said. ‘It was done for folk and fatherland.’ Neither minister would answer reporters’ questions and left the room after making their statements. Both men were ministers on behalf of the right-wing Liberal VVD. Earlier on Monday, the Telegraaf reported that the receipt for the payment had been found, proving that Teeven authorised the return of 4.7 million guilders to a convicted drugs dealer, without the knowledge of his superior or the tax office. Teeven was then chief public prosecutor. The deal, which was kept secret from the tax authorities, hit the headlines in March 2014 when H’s lawyer at the time said his client had been paid back five million guilders. The public prosecution department had sequestered around five million guilders in assets from drugs lord H – including property and jewellery. However, the department was unable to prove the assets had been obtained illegally and so most of the money was returned to H.
Teeven agreed to the deal in ‘complete confidentiality’ so that ‘national and/or international tax services and fiscal authorities’ were not informed, television current affairs show Nieuwsuur said earlier this month. Television commentator Ferry Mingelen said that by resigning now, the ministers have avoided difficult questions during the debate which was scheduled for Tuesday. The resignations come just nine days before the provincial elections, in which the ruling coalition is set to lose considerable support. Prime minister Mark Rutte said he had no choice but to respect the two men’s decision to stand down. ‘The cabinet is losing two driven professionals,’ he said.